A mosaic of recent images illustrates the dedication and emotion that are so prevalent at the UCLA Luskin School of Public Affairs. Dean Gary Segura is fond of saying that the UCLA Luskin School of Public Affairs is about human well-being. “We study ways to make individuals, families, communities and polities function better, for the improvement and quality of lives of all those affected,” Segura told the Class of 2017 at Commencement last June. “I’m reminded every day of how lucky I am and how special it is to be a part of the Luskin School of Public Affairs,” Segura told proud parents and family members at the graduation ceremony. 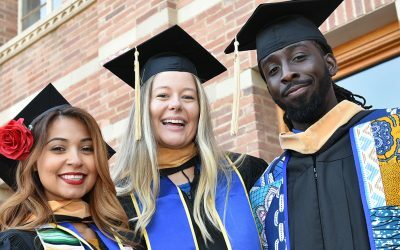 Like their planning and policy peers at UCLA Luskin, the School’s Master of Social Welfare students are connecting with the community throughout their two-year professional program. First-year MSW students have the opportunity to engage in high-impact internships and placements that begin even before fall classes start. New Luskin MSW students bring with them a wide range of experience in the community and at social work-related agencies, where they have served as students, employees and volunteers. From the get-go, they immerse themselves in the work of organizations that assist and provide programs for the homeless, the elderly, disabled adults, children with emotional and learning disabilities, and foster youth. 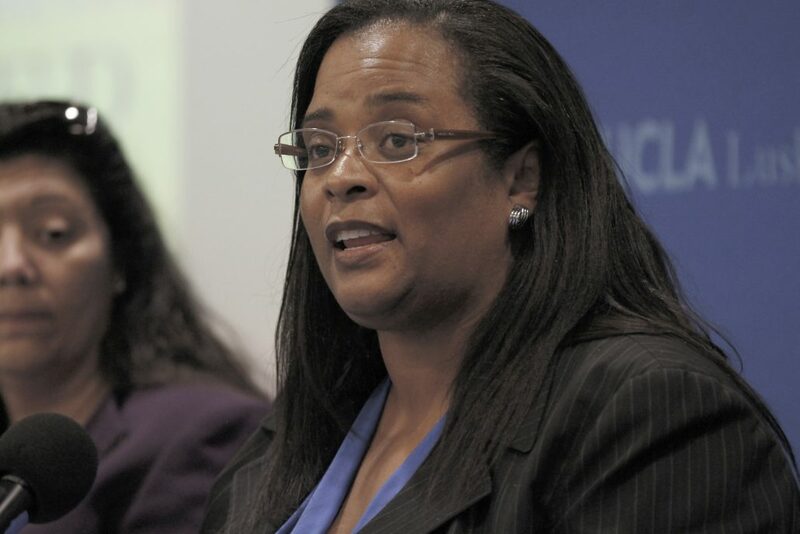 The wide array of student placements includes a downtown women’s shelter, a psychiatric care facility, school and community groups, and other sites that provide services such as law advocacy or assistance with transitional housing, according to Michelle Talley MSW ’98, field education faculty member. First-year MSW students are placed at various field sites throughout Los Angeles County and in surrounding counties, Talley said. Placements are based on previous experience, prior knowledge of the role of a social worker and other factors. Their extensive field work also involves community outreach and advocacy. They participate in staff meetings and offer consultation. They engage in research activities and participate in development programs that include training on professional responsibility and reporting mandates. Both years of the MSW program integrate the School, alumni and the community as integral parts of the educational process for this professional practice-oriented degree, assuring that graduates become high-impact practitioners. “The goal is to place students at sites that will create opportunities to enhance their growth as a professional social worker,” Talley said. From the streets of Los Angeles to innovative research on social media, UCLA Luskin faculty members like Ian Holloway are gathering data to inform programs and policies that improve the health and well-being of vulnerable communities. In addition to his position as assistant professor of social welfare at UCLA Luskin, Holloway is director of the Southern California HIV/AIDS Policy Research Center. There are approximately 5,000 new HIV cases in California each year. Holloway’s ongoing work focuses on HIV prevention and treatment among sexual and gender minority people. “Young gay and bisexual men, especially those from racial and ethnic minority communities, are disproportionately impacted by HIV, and HIV-related comorbidities,” Holloway said. In 2016-17, Holloway and a group of Luskin students and recent graduates canvassed more than 500 gay and bisexual men to gauge their awareness of a yearlong outbreak of meningitis in Southern California. Holloway and his research group found that less than a third of those interviewed were vaccinated against meningitis despite extensive outreach efforts by the California Department of Public Health. Holloway’s findings suggested that better vaccination uptake surveillance, tailored education and more sites for immunization throughout Southern California are needed in order to bolster efforts to track meningitis and encourage vaccination among gay and bisexual men. Other research conducted by Holloway and student assistants includes the LINX LA project, which uses a mobile phone app to encourage treatment engagement among HIV-positive African American young gay and bisexual men through access to legal and social service resources in Los Angeles. Next up? Using a new and innovative approach, Holloway and a group of tech-savvy UCLA researchers will use data-mining of social networking sites to learn more about drug use and sexual risk behavior. The project, funded by the National Institutes of Health, aims to use social networking data to inform intervention development. “This would include ‘just-in-time’ technology-delivered interventions aimed at preventing negative health outcomes and promoting healthy behaviors,” Holloway explained. 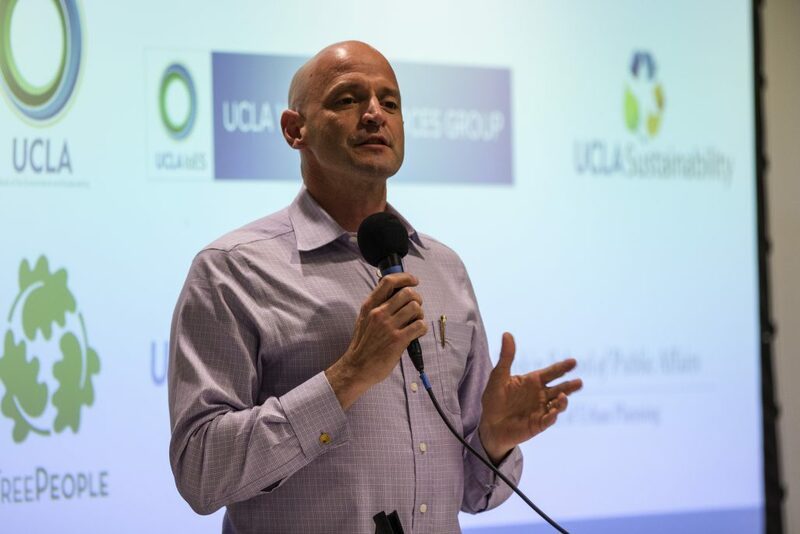 Whether it be guiding equitable revitalization of the L.A. River, helping Californians cut down on their electricity use, or advancing a new way to repurpose carbon dioxide into a greener form of concrete, the Luskin Center for Innovation is a trailblazer among UCLA’s many sustainability leaders. Since its inception in 2009, the Luskin Center’s research has influenced local, state and national policy. This includes a new rooftop solar program for Los Angeles, the redesign of California’s clean vehicle rebate program, and current efforts to develop a drinking water low-income assistance program in California. Other research informs the state’s world-renowned actions to combat climate change while maximizing local employment, air quality and health benefits. A think tank housed within the UCLA Luskin School of Public Affairs, the center is organized around initiatives that translate world-class research into real-world policy solutions. Current initiatives include advanced transportation, clean energy, climate action, digital technologies, sustainable water and urban greening — all linked by the theme of informing effective and equitable policies. The center brings together faculty and staff from a variety of academic disciplines across campus to conduct research in partnership with civic leaders who use the knowledge to inform policy and organizational innovations. Civic leaders include policymakers, nonprofit organizations, and business associations. Students at UCLA Luskin have the opportunity to work with the Luskin Center to gain hands-on research experience and work closely with these decision-makers. Each year, UCLA Luskin students are embedded in internships and research projects offered through all three departments. That’s a given. Not as well known is how the school also creates partnerships that benefit students and the communities in which they work. Take, for example, the Watts Leadership Institute (WLI). The brainchild of Social Welfare adjunct professor Jorja Leap MSW ’80 and her research partner, Karrah Lompa MSW ’13, the WLI is engaged in a 10-year mission to bring about positive change in a community hungry for leadership coaching. Leap and Lompa are working with the first cohort of community members, providing guidance on everything from learning how to establish successful nonprofits to applying those skills in their community garden. After several years of training and coaching, the cohort will provide guidance for future leaders in Watts. At the same time, Leap is using the project as a way to provide community-based educational experiences for Luskin’s Social Welfare students. The WLI has received funding from the California Wellness Foundation and from GRoW @ Annenberg, a philanthropic initiative led by Gregory Annenberg Weingarten, as well as office space and in-kind support from Los Angeles City Councilman Joe Buscaino. On Nov. 9, 2016, after many felt their world spin out of control, the Institute on Inequality and Democracy at UCLA Luskin decided to create a space for students, faculty and staff to critically analyze the forms of exclusion, including white nationalism, so pervasive throughout the election that had just ended. Post-election, the Institute, whose tagline is “Organizing knowledge to challenge inequality,” expanded its mission to challenge state-sponsored violence against targeted bodies and communities by immediately issuing a call for Jan. 18, 2017: Teach.Organize.Resist. Through academic research, and in alliance with social justice movements, the Institute creates scholarship, art and collective action to tackle divides and dispossessions in global Los Angeles and in cities around the world. The impact of the Luskin School resonates far beyond the borders of Los Angeles and California. It’s a brand with international flavor. It’s not unusual to find Luskin students and faculty in Mexico, Uganda, India or Japan. Luskin’s popular Global Public Affairs program offers students the chance to obtain intellectual and professional preparation to become future experts within the realm of international public affairs. Each year GPA students travel around the globe, immersing themselves in the culture — and problems — of their host countries, and blogging about it for the GPA website. In the past year, students have lived in Mexico City; Paris; Kampala, Uganda; Bonn, Germany; Santo Domingo, Dominican Republic; and Tokyo, among other locales. Urban Planning faculty like Paavo Monkkonen MPP ’05, whose students made multiple visits to Tijuana, Mexico, where they provided guidance to city and government officials about the best ways to deal with a housing crisis. Policy professors like Manisha Shah, associate professor of public policy, who has traveled around the world — to India, Mexico, Tanzania and Indonesia — to conduct research into microeconomics, health and development. Faculty leaders like Donald Shoup and Anastasia Loukaitou-Sideris who are among the many UCLA Luskin faculty in great demand as speakers at conferences around the world. Our international students — who add a global perspective to the student body and to Luskin educational efforts. Graduate students at UCLA Luskin don’t wait to step beyond the classroom to address California’s pressing challenges. Master of Public Policy (MPP) and Master of Urban and Regional Planning (MURP) students spend their time on campus deeply immersed in local, state, national and global issues. At the Luskin School, it’s part of the program. Luskin students log countless hours learning lessons from leading-edge faculty and researchers. Here they seek solutions related to ongoing problems like housing, transportation or sustainability. They look into topics of vital importance to Southern California like electric recharging stations, barriers to bicycling in and around the city, or accessibility to water and food. “At Luskin, we give students a diverse set of tools (both quantitative and qualitative) that will help guide them through the APP process and ultimately to go out into the real world and conduct policy analysis on issues close to their hearts,” said Manisha Shah, associate professor of public policy and faculty coordinator for the Applied Policy Project program completed by MPP graduates. 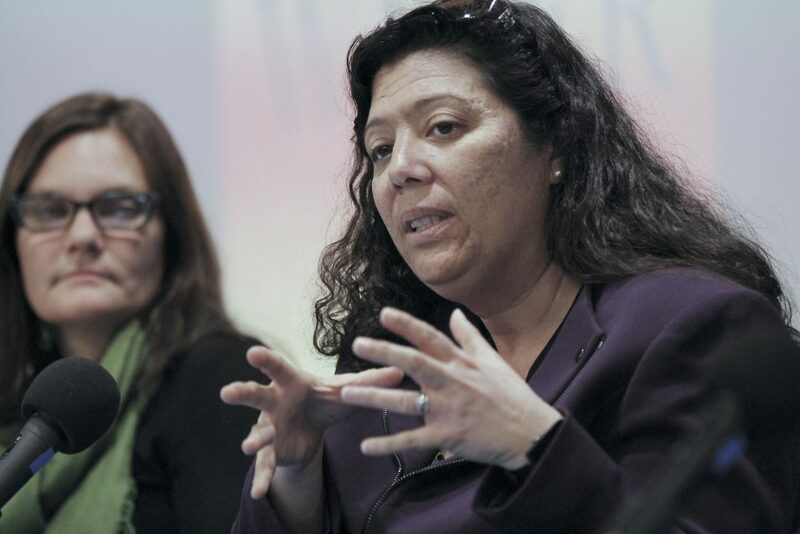 Recent work has connected students with county and city offices such as the Mayor of Los Angeles and the Los Angeles Department of Transportation. Regional agencies such as the Southern California Association of Governments (SCAG) frequently serve as clients. Recent APP projects included healthy food choices for elementary school students and employment opportunities for youths. Students also tackle educational issues right here at UCLA or work with the University of California’s Office of the President. the local level in the Ukraine. There’s no better place to study how people get around than Southern California — and for the past 25 years, UCLA has been home to one of the country’s preeminent transportation research centers. The UCLA Institute for Transportation Studies (ITS) at UCLA Luskin combines cutting-edge research with meaningful, influential civic engagement to lead to policy results in California and beyond. From the impacts of traffic congestion to fairness around rideshare hailing to the civic consequences of paying for parking, ITS scholars produce work that ties directly to current transportation planning practices and policymaking at the local, state and national levels. ITS is noted for connecting transportation and equity, and for emphasizing the effect of transportation decisions on people’s lives. “We take our policy mandate seriously,” said Brian Taylor UP PhD ’90, director of ITS and professor of urban planning. Through close partnership with dozens of outside organizations that include government agencies, private transportation companies, nonprofit foundations and advocacy groups, ITS faculty, staff and students translate the latest knowledge on transportation into proposed real-world policies around movement and growth. ITS’ biannual digital magazine is widely read throughout the transportation community, highlighting important new research in a clear, constructive manner for practitioners. Luskin students working at ITS collaborate closely with faculty members, receive generous scholarship funding for their own trailblazing projects, and have garnered an inordinate number of prestigious grants and awards over the years. Regular interactive events and publications showcase student findings to the academic community and the public at UCLA and around the country. The next quarter-century will bring significant changes to how we travel, with daunting societal impacts. As it has since 1992, ITS research and policy action will help guide the way toward solutions. Attend any gathering at UCLA Luskin and you may feel like you stumbled into someone’s family reunion. There will be a toddler or two, chasing a balloon or dancing as a faculty, staff or student parent hovers nearby. You’ll notice plenty of happy young faces — graduate students tend to be in their 20s — but look closer, and you’ll see older folks too. Mid-career professionals returning to add a degree. Staff and faculty, some grayed and others not. Perhaps alumni who earned degrees during the days of typewriters or even pencil and paper, not smartphones. But family is more than differences in age. It’s continuity. Legacy. Progress over time, as one generation blazes a trail and then passes the torch of knowledge along to another to mark its own, slightly different path. It’s every professor who imparts a tidbit of knowledge only to be surprised, and humbled, when a protégé nurtures that information into something new and wonderful and impactful. A lifetime of learning walks the Public Affairs Building each day — legends who become mentors, colleagues, even friends. Marty Wachs. Joan Ling. Mark Peterson. Michael Dukakis. Ananya Roy. Gerry Laviña. And so many more. People who have done everything in their careers that students could ever dream of doing themselves and yet still seem to care most about what their students learn now that will improve the world tomorrow. Family provides inspiration. At Luskin, it’s instructors who know how to say, “You can do better,” in a way that makes students understand that, yes, they really can. Families help those who need it. It’s every person on the Donor Honor Roll whose name is there not because their wealth exceeds their needs but because money is a way to honor someone who once expanded their worldview. Or lifted their spirits. Or answered a question late one night as a deadline loomed. This sentiment expressed by Debbie Franco of the California Governor’s Office of Planning and Research is typical of the conservation advice offered by a panel of water experts during a Feb. 22, 2017, presentation at the UCLA Luskin School of Public Affairs. Spearheading the discussion was Brian Richter, an adjunct professor at the University of Virginia and author of the book “Chasing Water.” Richter outlined the historical relationship between humanity and water. He also explained his ideas to formulate a “water market” that would monetarily encourage responsible water usage on the personal, industrial and governmental levels. 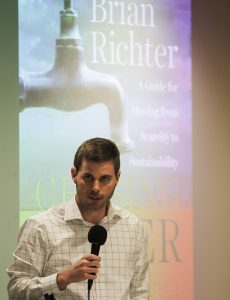 “Disruption needs to happen more on the governmental level,” said Richter about the best approach to lessen overuse and foster more cooperation between city, local and state governments regarding an ongoing world water crisis. An example of intergovernmental partnerships is San Diego’s annual $60-million investment to encourage smarter water use by farmers in the Imperial Irrigation District in return for access to a third of the city’s water supply. Water is especially important for California governments and residents in light of the historic drought affecting the region. During a question and answer session led by the Luskin Center for Innovation’s Greg Pierce MA U.P. 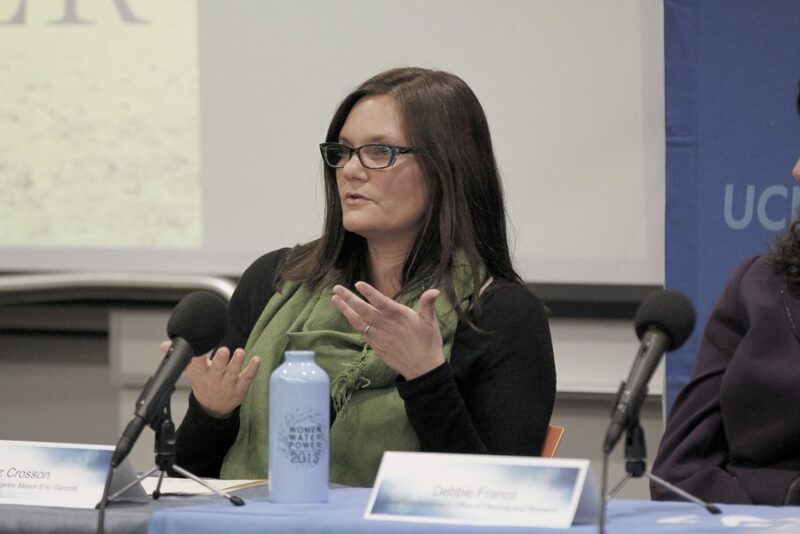 ’11 UP PhD ’15, panelists discussed how to keep momentum toward sustainable water systems despite recent downpours estimated at about 19 total inches of rain — equal to about 27 billion gallons of water. Franco argued that the solution to the water issue needs to go beyond collaborative government — it has to become a way of life. He noted a core argument of his book, that in order to have a fully active and informed citizenry, the science and policy communities need to fully understand water themselves. Panelist Liz Crosson from the Los Angeles Mayor’s Office told the large crowd that attended the session that Los Angeles has instituted a Save the Drop campaign in partnership with the mayor’s fund, working to reach a 20 percent reduction from the 103 gallon per day of water usage per capita in the city. Even if successful, that mark is well short of Australia’s average of 50 gallons per day as noted by Richter in his book and lecture. The city’s plan involves combating water illiteracy in combination with incentives and restrictions on water use. The city has also updated its rate structure to be more compatible with different socioeconomic brackets. Amid a crowd that included UCLA Luskin students and faculty as well as interested members of the community, passions sometimes ran high, with some questioning whether current efforts and ideas are sufficient to truly improve water conservation. Panelists noted the importance of individuals working closely with local government in order to push for reforms they want to see. 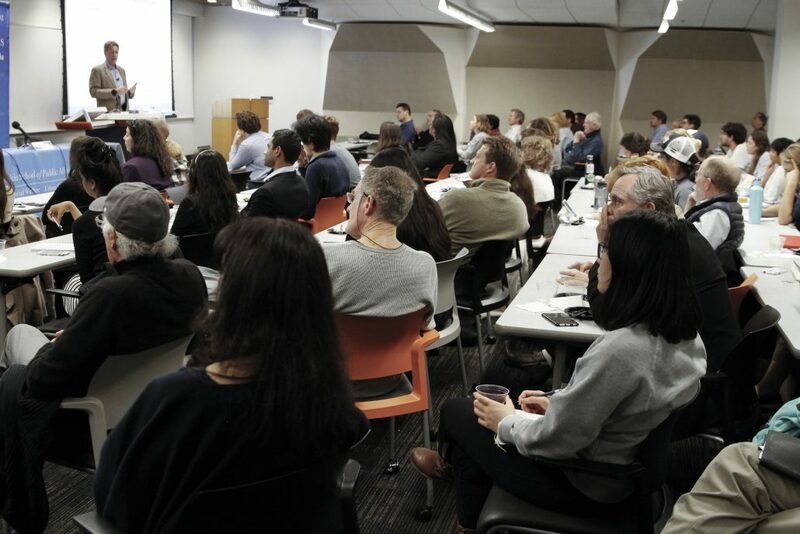 The lecture and panel discussion were put together by the UCLA Luskin Center for Innovation in partnership with Island Press as part of a speaker series known as Luskin Innovators. The Rosalinde and Arthur Gilbert Foundation has a awarded a grant of approximately $80,000 to the Luskin Center to develop a “how-to” manual for community-driven greenway projects along the Los Angeles River. Recognizing the vast untapped potential for accessible active transportation and healthy recreational opportunities along the River, and several decades of progress already made by community-based non-profits and local government in the northern part of the River, the Luskin Center set out to compile, analyze and repackage decades of institutional wisdom into an accessible and application-oriented guide called a “toolkit.” This toolkit will present step-by-step instructions for community leaders interested in developing: 1) a multi-modal linear pathway along the Los Angeles River, 2) a River-adjacent green open space, 3) a neighborhood access point or 4) a multi-modal bridge to improve access across the River. 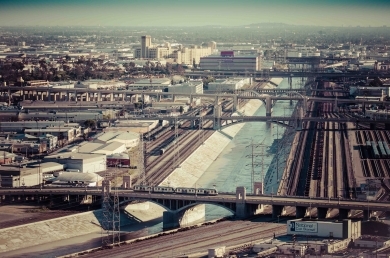 Despite several decades of grass-roots and local government attention to the Los Angeles River, communities still lack the resources and tools that they need to engage directly with the River revitalization process. The Los Angeles River Greenway Toolkit project fills a vital gap with an accessible and well-researched guide designed to support river-adjacent communities. 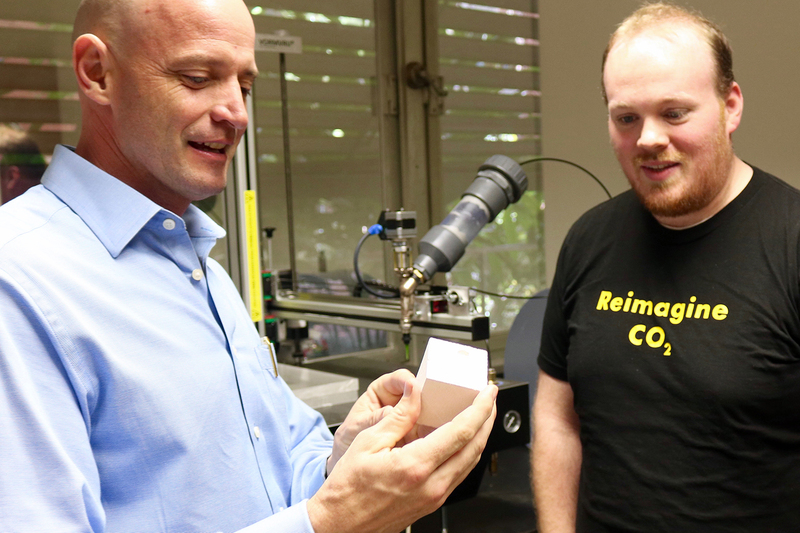 Henry McCann is the project manager and is working with graduate student researchers Andrew Pasillas and Shafaq Choudry, in addition to collaborating with a myriad of community organizations. “A rolling water treatment plant designed by UCLA researchers made a pit stop on campus this week before heading north to the San Joaquin Valley, where it will help address California’s inadequate water supply. The first of its kind, the plant, installed in a 40-foot cargo container, is designed to desalinate and purify as much as 27,000 gallons of agricultural runoff and groundwater a day. That’s equivalent to the average daily water use of about 90 U.S. families. In mid-March, the UCLA Luskin Center for Innovation attended the Plenary Meeting of the California Urban Water Conservation Council (Council) to accept membership in the Council of over 400 urban water suppliers, environmental advocacy organizations, and water policy researchers. Formed in 1991, this collaborative forum brings together urban water suppliers, the water policy community, and environmental advocates to advance water conservation throughout the state. The Council develops innovative practices and technologies for water efficiency and conservation, encourages effective public policy decision-making, advances research, training, and public education, and builds on collaborative partnerships. The Council’s founding Memorandum of Understanding requires urban water supplier signatories to provide detailed information about their water supply sources, water deliveries, water distribution and billing systems and implementation of water conservation rebates and incentives. This rich dataset will form an important part of current research proposals in the Luskin Center’s Smart Water Systems Initiative. Using drought and the long term impacts of climate change on the region’s water resources as a contextual lens, the Luskin Center will identify urban water agencies in Southern California that are increasingly resilient to short and long term drought conditions. The Luskin Center will also identify those agencies that are increasingly vulnerable to current and future drought conditions. As proposed, this analysis will be presented as an online web-mapping tool and database called the Southern California Water Atlas and Archive. This project will provide valuable resources for furthering water policy research initiatives, improving local water supply planning, and enhancing regional resiliency to climate change impacts. Urban water supply signatories to the Council’s MOU are required to self-report and deliver data every two years. Many of the datasets collected before 2008 are still in hardcopy format, while all records submitted after 2008 are stored in digital format. Data collected by the Council includes information on water sources and uses, utility operations and practices, water loss control, metering, retail conservation pricing, retail wastewater rates, public information programs, rebates for residential, industrial, commercial, and institutional water customers, and landscape conservation programs. The California Urban Water Conservation Council emerged in the mid-1990s from a growing concern for water supply reliability and the efficient use of water resources through conservation. To assist urban water agencies in achieving this goal, urban water suppliers, water policy analysts, and environmental groups created the nonprofit organization. Over several decades, the Council grew into a hub for innovative practices and policies that advance water conservation efforts statewide. Many attribute major decreases in per capita urban water usage in Southern California over the last several decades to the Council’s efforts. L.A.’s Griffith Park shows signs of the California drought, which is now in its third year. Yoram Cohen is working on it. For the past two years, in the backyard of a house in West Los Angeles, the UCLA professor of chemical and biomolecular engineering and director of the Water Technology Research Center has been field-testing a “vertical wetlands” that mimics a wetlands in nature. That’s when dirty water gets naturally filtered as it runs through an expanse of plants, rocks, soil and indigenous bacteria as it makes its way to a river or other waterway. Cohen’s Gray2Blue Mobile Wetland Graywater Treatment System cleans hundreds of gallons of “gray water” — runoff from the test home’s showers, bathroom sinks and laundry machine — that is then reused to irrigate trees and gardens. The Gray2Blue pilot system, with its maximum output capacity of 560 gallons of reusable water a day, could conceivably save Californians billions of gallons of water. But it would require changes to state water regulations that, in many ways, slow the march toward water sustainability. Cohen is working on that too. Cohen is working in collaboration with chemical engineering Ph.D. student Zita Yu, whose research focuses on the development of Gray2Blue and the policy and economic aspects of onsite graywater treatment and reuse in urban and rural areas. Also onboard is the Luskin Center for Innovation at the UCLA Luskin School of Public Affairs. Their intent is to build a case for California regulators and residents alike to rethink how we use water. Gray water from the test home’s bathroom sinks, showers and laundry is pumped outside into a holding tank. Gray2Blue, a refrigerator-size contraption of white plastic crates and plumbing topped with a patch of colorful flowers, challenges that notion. Graywater is pumped into the flower bed and, over a period of about three hours, percolates down through a two-foot layer of plant roots and soil that act as “phytoremediators” that filter out particles and contaminants. The water then passes through a biofilm layer of scum-eating bacteria and finally drips like gentle rain into a collection bin connected to irrigation pipes and a storage tank. Reusing gray water isn’t a new concept, the researchers say, but Gray2Blue takes it to a whole new level. The water it produces is of high enough quality to meet California’s Title 22 standards for tertiary, disinfected, reclaimed water — water for aboveground, non-potable reuses like sprinkling a lawn or flushing a toilet. But under current regulations, Cohen noted, treated gray water can be used only sub-surface, as in the test home’s underground irrigation system. That leaves a large quantity of high-quality, filtered water going to waste, while the home’s above-ground lawn sprinkler and toilets continue to draw from the household’s supply of potable water. The Gray2Blue system cleans gray water that is pumped into the flower bed on top and slowly percolates down through layers of soil and biofilm that serve as natural filters. Gray2Blue’s efficiency in harvesting high-quality water bolsters Cohen and Yu’s determination to persuade policymakers to reassess state water regulations. To this end, the researchers have been producing policy papers, including a recent analysis of water regulations in all 50 states. Also in need of revision, he said, is the regulatory process for certifying a system like Gray2Blue. Currently, the state requires individual homeowners to regularly monitor and report on water quality if they install such a system. “This puts a tremendous burden on the homeowner as if he or she were a major water treatment plant,” said Cohen. Instead, he said, regulators should certify not the individual users but the Gray2Blue system — the same way that household appliances are certified. Cohen and Yu have also engaged in exhaustive number-crunching to determine everything from how much water the state can conserve to how much money homeowners can save: Every day a typical Californian uses about 198 gallons of water, about 62 gallons of it indoors. About half of that — some 31 gallons — ends up as gray water that could be filtered and reused. Multiply that by 37 million Californians, and that’s 1.1 billion gallons of potable water that could be saved every day. With water rates in the city of Los Angeles currently running about $10.60 per 1,000 gallons, homeowners will save money with a system like Gray2Blue. They’ll also save on sewer charges, because water reused for watering a lawn doesn’t end up down the drain. This also helps relieve overloaded septic systems in homes that do not have sewer services. By Cohen and Yu’s calculations, Gray2Blue — which was constructed with off-the-shelf components that run around $500-$600 or $1,300-$1,500 with the addition of an irrigation computer timer for the water pumps — could pay for itself in six months to two years. And the savings after that could add up to $2,000 a year. Cohen suggested that the state could offer homeowners a financial incentive, as it does with solar panels, to make the return-on-investment even faster. The researchers have demonstrated the system to local and state officials, among them the Metropolitan Water District of Southern California — which provided some funding for their research — and the L.A. Department of Water and Power. Cohen and Yu have also been presenting their work at water conferences nationally and internationally. Yu recently showed Gray2Blue to officials in Hong Kong’s Water Supplies Department, which is exploring options for gray water and who were also very interested in learning about U.S. regulatory incentives and impediments. As featured in a recent story on KCRW-89.9 FM’s “Which Way, LA?,” Professor Yoram Cohen and doctoral student Zita Yu, along with colleagues including Professor Michael Stenstrom, developed a low-cost technology that turns graywater waste into a residential resource. Named the Gray2Blue Mobile Wetland System, the technology has been at use in a home in West Los Angeles as part of a demonstration project supported by the Luskin Center. The system filters the home’s “graywater” – soapy water from sinks, showers and laundry – and pipes it out again to irrigate citrus trees and vegetable gardens. Plants are also a part of the system itself, helping to filter the graywater. Roughly about 50 percent of the water that is used in a home ends up as greywater,” said UCLA engineering professor Yoram Cohen. “And if we can reuse that water, you can immediately see that the savings in water is going to be tremendous.” Cohen and Yu are now presenting their results to local and state water, health and zoning officials to inform decisions on how to regulate the further use of graywater in southern California. The results include data from a financial assessment supported by J.R. DeShazo, an environmental economist and director of the Luskin Center. All of this could mean that one day in the not so distant future, you too could turn the water going down your sink into a resource your plants will love. Internationally, other cities are also starting to take notice. Yu, who was recently selected as a C200 Scholar by the prestigious Committee of 200 Foundation, presented on the regulation, technology and economics of onsite graywater reuse to the Water Supplies Department and its Advisory Board in Hong Kong. Hong Kong is considering including graywater into their water portfolio. Green power. Solar energy incentives. Renewable energy. Smart water systems. Planning for climate change. Clean tech in L.A. For the next three years, the UCLA Luskin Center for Innovation has set an ambitious goal to produce research that will help Los Angeles and state and federal agencies reach the Holy Grail of environmental sustainability. Five Luskin scholars are working on initiatives that could change how residents, businesses, industries and government meet the challenge of living more sustainably. The Luskin center is carrying out a mission that was broadly outlined by Chancellor Gene Block in his inaugural address on May 13, 2008: to marshal the university’s intellectual resources campuswide and work toward intense civic engagement to solve vexing local and regional problems. “I believe that UCLA can have its greatest impact by focusing its expertise from across the campus to comprehensively address problems that plague Los Angeles,” the chancellor told an audience in Royce Hall. The five scholars working on the six initiatives are DeShazo; Yoram Cohen, an engineering professor and director of the Water Technology Research Center; Magali Delmas, professor of management and the IoE; Hilary Godwin, professor of environmental health sciences; and Matt Kahn, professor of economics in the departments of Economics and Public Policy and IoE. “We started off by identifying problems that our community is facing and that it can’t solve,” DeShazo said. Then, they asked two questions: “Does UCLA have the research capacity to address this deficit? And can we find a civic partner who can make use of this new knowledge?” Proposals were prioritized by a 16-member advisory board with a broad representation of business and nonprofit executives, elected officials and a media expert. Among the high-profile board members are State Senators Carol Liu and Fran Pavley; Mary Nichols, chairman of the California Air Resources Board; Los Angeles Council President Eric Garcetti and Controller Wendy Greuel; Assemblymember Mike Feuer; John Mack, chairman of the Police Commission; and William Ouchi, professor of the Anderson School and chairman of the Riordan Programs. “We take our research ideas and develop real-world solutions that can be passed on to a civic partner with whom we can engage and support,” DeShazo said. “We let them carry through with the politics of policy reform as well as the implementation. We don’t get involved in advocacy.” An array of local green research DeShazo recently completed Luskin’s first initiative with his research on designing a solar energy program for L.A. that would minimize costs to ratepayers. His research – the basis of Mayor Antonio Villaraigosa’s new energy policy – proposes a solar feed-in tariff that would help everyone from homeowners and nonprofits to commercial property owners buy solar panels and be able to sell their solar energy to utility companies for a small profit. Other Luskin research initiatives involve creating smart water systems for Southern California with water reclamation, treatment and reuse (UCLA researcher Cohen will work in partnership with the Metropolitan Water District); helping local governments plan for climate change (DeShazo with the California Air Resources Board and the Southern California Association of Governments); and reducing toxic exposures to nanomaterials in California (Godwin with the National Institute of Occupational Safety and Health.) In another initiative in partnership with the Mayor’s Office and the California Air Resources Board, researchers are compiling a database of jobs created by clean tech activities in L.A. County and will document best practices that other cities have used to attract and support clean tech development. Luskin’s Kahn is working with the Sacramento Municipal Utility District to pinpoint what determines how much electricity is used by residential and commercial consumers and how the district can market its major green energy programs to increase participation. Finally, Delmas is looking into whether the Green Business Certification Program approved recently by the City Council will reduce the overall carbon footprint of small businesses. The program offers incentives and assistance to small business owners in L.A. to become more efficient and less wasteful in their everyday practices. Those businesses that meet certain “green” criteria will be certified as being environmentally friendly. Her partner in this venture is the Los Angeles Department of Water and Power.